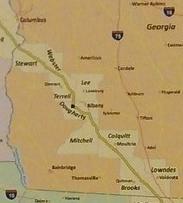 We would like to hear from you about the proposed Sabal Trail Transmission Gas Pipeline project. The proposed Sabal Trail Transmission Gas Pipeline project would transport up to a billion cubic feet of natural gas each day through about 24 miles of Dougherty County on its 465-mile route from central Alabama to central Florida. 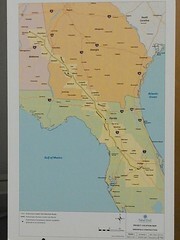 The natural gas carried by the pipeline is intended to provide electricity for a large portion of the state of Florida. That contact information is all for contacting FERC. While no doubt Rep. Bishop himself is most interested in hearing from constituents, it doesn’t say just constituents, nor was his listening session in Albany limited to just constituents. Congressman Bishop’s own own contact page does say he is only able to reply to e-mails from constituents. Here’s how to find your own representative. And here are links to contact information for every Congress and statehouse member and county commission and city council of county seats of counties in all three states (Alabama, Georgia, and Florida) along the proposed pipeline path. 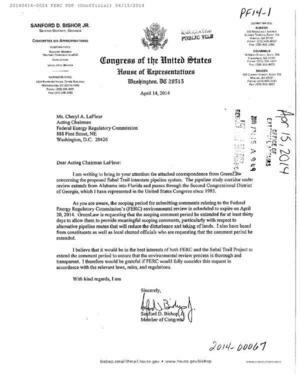 Filed with FERC 16 April 2014 with special subject “Congressional Submittal submitted in FERC PF14-1-000 by US HOUSE OF REPRESENTATIVES”. Rep. Bishop is listening to citizens about the pipeline 10AM Thursday 17 April 2014 in Albany, GA. The session is being held to allow citizens to provide feedback and share concerns with the Congressman on the proposed Sabal Trail Transmission Gas Pipeline Project. This is a very significant concern for a variety of reasons, among them public safety, environmental and economic impact.